The doctrine of the Trinity goes something like this: God is three persons, each person is fully God, and there is one God. Three distinct individuals/persons, each with all of the full attributes of the Godhead, yet one in essence/substance. Each person is equal in being, but the Son and the Holy Spirit are subordinate to the Father in role. The distinctions between the members of the Trinity are in the manner in which they relate to each other and to the rest of creation. The doctrine of the Trinity lies in the divine self-disclosure in Jesus, who as the Son revealed the Father and poured out in the Holy Spirit. Wayne Grudem, Systematic Theology: An Introduction to Biblical Doctrine (Grand Rapids, Mich: Zondervan, 1994), 226. Perichoresis is the theological concept that the Divine essence is shared by each of the three persons of the Trinity in a manner that does not deny their individual personhood. When the Father, or Son, or Holy Spirit act individually then that action is also the work of the other two persons. In other words, when you get one person of the Trinity, you get them all. Stanley Grenz, David Guretzki, Cherith Fee Nordling, Pocket Dictionary of Theological Terms (Downers Grove, IL: Intervarsity Press, 1999), 26, 116. Scripture [says] … “I will pray the Father, and He shall give you another Comforter, that He may abide with you for ever.” He will not therefore depart when the Father and the Son come, but will be in the same abode with them eternally; because neither will He come without them, nor they without Him. 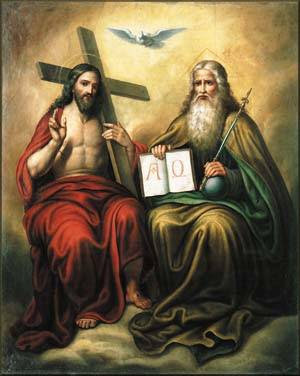 But in order to intimate the Trinity, some things are separately affirmed, the Persons being also each severally named; and yet are not to be understood as though the other Persons were excluded, on account of the unity of the same Trinity and the One substance and Godhead of the Father and of the Son and of the Holy Spirit. This entry was posted in Early Church Father, Trinity and tagged Augustine, Trinity, Trinity Sunday on June 18, 2011 by GlennDavis.